There is a hidden gem about ten miles outside of Montpelier, Vermont. Once you leave the state’s capital, you simply drive north on Rt.12; ten simple miles and you are no longer surrounded by coffee shops, bookstores, and bars. Instead, you are greeted with rolling hills and green fields in the forefront, and mountains softly standing in the distance. The beauty of this state, I believe, is the hundreds of hidden treasures that are tucked away in the woods. It’s a convenient comfort that one can have access to the amenities that cites like Burlington and Montpelier offer, and within minutes escape to the serenity of solitude and seclusion. 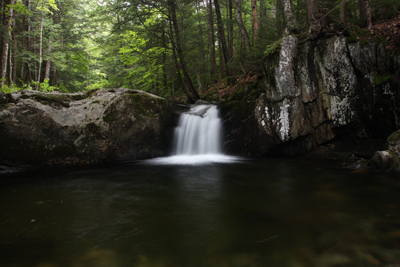 This place is called Hancock Brook Falls, but has been nicknamed “The Pots” by the locals here in Worcester. The Pots is a swimming hole that is created by the brook that cascades through a valley of the Winooski River; the water rushes downward and spills over slick, black rocks that have been worn down into small-sized holes. What you now have is a natural swimming pool with chilly, fast-flowing water—a beautifully refreshing spot to escape to. We have just driven eight hours from New York City, and are relieved to find ourselves back in the woods. We’ve been living in New York for a while now, and the city has tired us, worn us down. Back in the woods we feel rejuvenated, the natural life around us resonating in our veins. The sun was shining high above us when we were in Montpelier. It warmed our skin, forming beads of sweat on our backs, and we thought a trip to The Pots would be a perfect way to cool off. However, as we left the city, the sun started to slowly disappear behind the clouds. The temperature dropped, but we were still destined to enjoy the invigorating feeling of jumping into the chilly water. By the time we found ourselves deep in the woods, the tall trees were disguising the now ominous sky. We stripped down to our bathing suits, shrugged that we didn’t have any towels or an extra change of clothes, and started climbing down the slick rocks into the pools of icy water. I was timid at first, only getting ankle deep in the shallow pools. Once my body became numb to the shocking temperature, I crouched down into the water and let the current flow over my thighs, ripples zigzagging around my wrists. I started climbing down the brook; the water was splashing up at my waist now, and I was ready to make a plunge into a deeper pool, immersing myself completely into the water. Just then—crack. Moments later, a roll of thunder that shook the trees surrounding the river. I immediately looked up at the sky just as it opened up its dark belly to me. Hail. Have you ever been hit by hail before? I hadn’t, and found this experience especially unique, considering I was in the middle of a flowing brook, waist deep in icy water, and in a bathing suit. It’s not particularly…comfortable. And yet, I couldn’t help but beam. Hail was getting caught in my hair as I tried to scramble up the rocks; water, both river and rain, splashed in my face, blinding my vision. And at this moment my body was no longer cold; I had let the ice and the freezing waters and the slippery rocks and the wet moss consume me, and I simply became a part of the brook. I was giving myself into nature in its truest form. I was completely vulnerable, completely at peace. I managed to find some shelter under a tree on the opposite side of the riverbank, but soon enough the leaves could no longer hold in all the liquid. I sacrificed myself back in the brook, and scrambled up the rocks as the hail jabbed at my exposed, rosy skin. Within minutes I was climbing up out of the river and onto the road where our van was parked. I got in the van and laid down on the front bench, letting my shaking body slowly calm down, easing my breaths into a controlled rhythm. The hail tapped on the roof and slid down the windows, reminding me that deep in the woods, nature is in charge. Posted on June 24, 2011, in Uncategorized. Bookmark the permalink. Leave a comment.